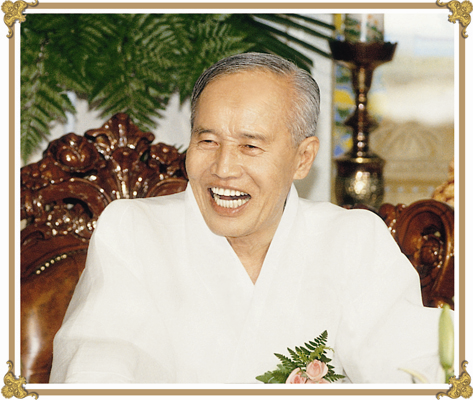 Ahn Un-san, His Holiness the Taesang Jongdosanim of Jeung San Do, was born in Korea in 1922. Both of his parents followed Sangjenim’s teachings, and he learned to meditate as a young child. In his childhood, during a two-week period of intensive meditation, he became awakened to the way that Sangjenim’s holy work of renewal was unfolding in the world, and he realized that his own purpose in life was to convey Sangjenim’s truth. During his teenage years, the Taesang Jongdosanim traveled independently throughout his homeland and China. After Korea’s liberation from Japan in 1945, he founded a movement to disseminate Sangjenim’s teachings, calling it Jeung San Gyo (“Teachings of Jeung-san”). This organization constituted the second stage of dao dissemination, the successor to Taemonim’s movement. In the years that followed, the Taesang Jongdosanim tirelessly gathered and taught tens of thousands of people throughout Korea. He was the first to diagram the cosmic year cycle, contextualizing the birth, growth, and maturation of human civilization. With the outbreak of the Korean War in 1950, Korea entered another dark and difficult period, and the Taesang Jongdosanim disbanded his movement on the Winter Solstice of the following year, instructing the followers to maintain their belief. In 1954, he retreated from publicly undertaking Sangjenim’s work for twenty years, until he and Ahn Gyeong-jeon, His Holiness the Jongdosanim, founded the modern movement of Jeung San Do, the third and final major development in Sangjenim’s dao. Now in his eighties, the Taesang Jongdosanim still conveys the teachings of Sangjenim and Taemonim with youthful vitality.